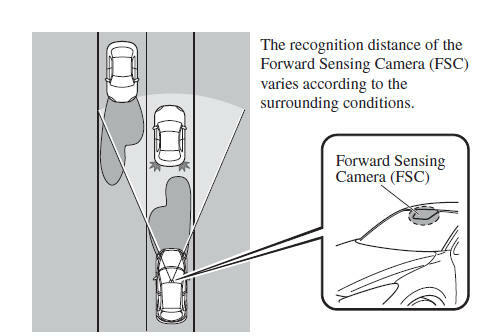 The High Beam Control System (HBC) determines the conditions in front of the vehicle using the Forward Sensing Camera (FSC) while driving in darkness to automatically switch the headlights between high and low beams. While driving the vehicle at a speed of about 30 km/h (18 mph), the headlights are switched to high beams when there are no vehicles ahead or approaching in the opposite direction. The system detects a vehicle or the headlights/lights of a vehicle approaching in the opposite direction. The vehicle is driven on roads lined with streetlamps or on roads in well-lit cities and towns. The vehicle is driven at less than about 20 km/h (12 mph). The warning light fl ashes when the system has a malfunction. Do not adjust the vehicle height, modify the headlight units, or remove the camera, otherwise the system will not operate normally. The timing in which the system switches the headlights changes under the following conditions. If the system does not switch the headlights appropriately, manually switch between high and low beams according to the visibility as well as road and traffi c conditions. When there are sources of light in the area such as street lamps, illuminated signboards, and traffi c signals. When there are refl ective objects in the surrounding area such as refl ective plates and signs. When visibility is reduced under rain, snow and foggy conditions. When the headlights/rear lamps of vehicles in front of you or in the opposite lane are dim or not illuminated. When there is suffi cient darkness such as at dawn or dusk. When the luggage compartment is loaded with heavy objects or the rear passenger seats are occupied. When visibility is reduced due to a vehicle in front of you spraying water from its tyres onto your windscreen. The High Beam Control System (HBC) operates to switch the headlights automatically between high and low beams after the ignition is switched ON and the headlight switch is in the AUTO and high beam position. At the same time, the High Beam Control System (HBC) indicator light (green) in the instrument cluster illuminates. The High Beam Control System (HBC) determines that it is dark based on the brightness of the surrounding area. When the vehicle speed is 30 km/h (18 mph) or higher, the headlights automatically switch to high beams when there are no vehicles ahead or approaching in the opposite direction. When the vehicle speed is less than about 20 km/h (12 mph), the High Beam Control System (HBC) switches the headlights to low beams. The low beams may not switch to high beams when cornering. Operation of the High Beam Control System (HBC) function can be disabled. Refer to Personalisation Features on page 9-13 . Shift the lever to the low beam position. The High Beam Control System (HBC) indicator light (Green) turns off.